-I'd actually have to give the advantage to Ben on this one. He got a few shots in and got his man to the ground. -Yeah, Hordichuk handed Rupper a new one on this. Almost looked like he was caught by surprise. Pens get on the board quickly. Letestu takes the outlet pass from TK and patiently waits for Vokoun to fall over himself and then just throws it into the cage. Panthers respond quickly. Stephen Weiss shoots one on net that goes off Johnson's glove before going in. Also it was Florida's 1st shot of the game. 5 minutes of up and down before Crosby snipes one from the left side. Amazing how much power he got behind it, and Brent Johnson also gets a point on the play. 3 minutes later the 2nd line comes up with a great shift. Talbot throws one on goal, Vokoun can't control it and Cooke steals it and fires it home. 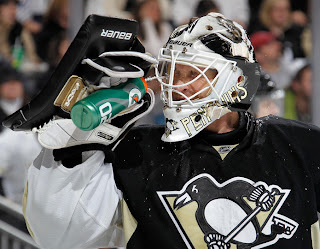 Vokoun chased. Panthers start to dig for momentum and Shawn Matthias challenges Ben Lovejoy to a fight (he must not have studied much film). Lovejoy answers the bell and takes care of business. Pens put together some great puck possession but take a late penalty. Florida dangerously close to scoring at the end, but Johnson holds on. Notes: I was a little worried about Johnny after that first goal but he recovered quite well. Never even considered Florida's PP a threat. Still can't believe Ben Lovejoy fought. We got this one in the bag already. Pens kill off the rest of the penalty easily. Zbynek Michalek in beast mode. Then the game turns to nothing for a few minutes. Pens start to pick things up and then Lovejoy cashes in for his 1st NHL goal. Panthers get desperate and the hitting starts to pick up. Midway through the period Hordichuk beats the stuffing out of Rupp. Pens get a powerplay, no dice. Then Florida gets a powerplay and the Pens kill it off easily. Then Florida continues the cycle and takes another late penalty but Clemmensen holds his ground from the Pens' barrage. Fleury starts the 3rd because Johnson got some sort of lower-body injury late in the 2nd. Asham is also missing from the bench. Fleury does a stellar job holding off an early Florida powerplay (especially because he had no warmup) to keep it at 4-1. Then the game turns into a sleeper for a while. Florida had some chances but Flower was on it. Finally the Panthers score but it's way too late to count for anything. Scary moment when Lovejoy takes a puck to the face in the final 3 minutes and he heads off for stitches (he seemed to be ok after the game). Dupuis adds an empty netter in the last 30 seconds. PENS WIN 5-2. Notes: They played a 3rd period? I didn't notice because the Pens were already on the bus for D.C. This would be cause for alarm in a 1 or 2 goal situation, but nothing to worry about in this case. -Sid's point streak extended with his 1st period goal. 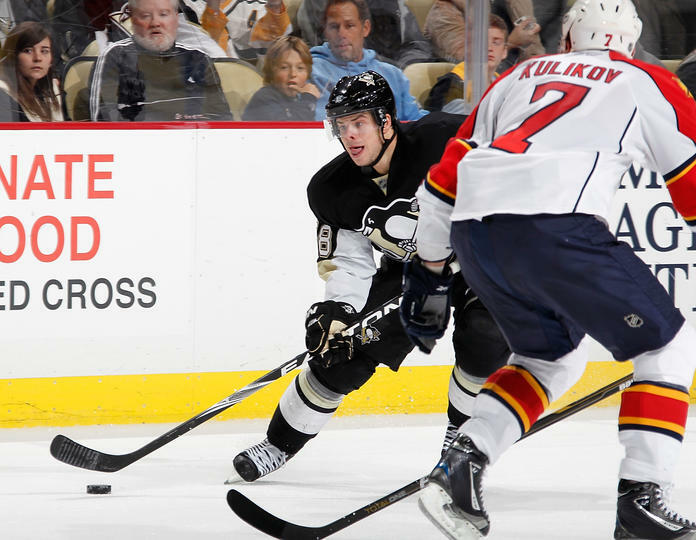 -Malkin wasn't quite as hot as he has been, but he did get an assist. -Zbynek Michalek was yet again golden in the PK. -Lovejoy showed toughness and talent and maybe stated his case for more minutes. 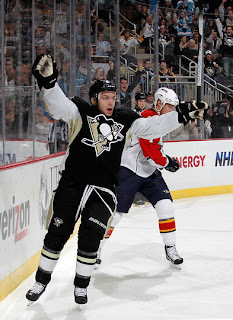 -Kunitz giving 100% as usual. -Have no idea what happened to Asham. Hope he's ok or else somebody from WBS will have their holiday vacation cut short tonight. -Panthers actually weren't bad tonight, but they just didn't have the firepower. "The game was over in the first 10 minutes." -Cookie's goal was lights out for Florida.